Ladies, Gentlemen, Everyone in between… I’ve been home from Burning Man for a MONTH now and I’m just now getting some words ready to share. I’ve tried to write an account of Burning Man a hundred and seventeen times, and I never feel like I do it any justice. It’s just too big of an idea. Even if I were to write a perfectly worded treatise, I would still fail to fully communicate to you what Burning Man is. It’s futile – like trying to explain what the color purple is to a blind person. Burning Man is a magical oasis in the Desert. Beautiful serendipities are inevitable when you bring together 70,000 highly intentional creative beings into a temporary city and empower them with the 10 Principles of Burning Man. Things happen out there that defy description. Every. Single. Day. I went out there with one basic goal in mind: to have experiences that would help me connect more clearly to my artistic voice. For the past two years, I have been working in radio at KTALK 630 AM. It has been an amazing opportunity to learn how to produce a show, learn to broadcast, and most importantly, to find my voice. Although I have made a ton of progress, I have felt like somehow I was still holding myself back. I hadn’t quite found my groove. I wasn’t placing demands on Burning Man to deliver this epiphany to me, but I certainly hoped for it. The art theme for Burning Man 2015 was “Carnival Of Mirrors” – an apropos theme for a guy who’s trying to gain more artistic clarity. 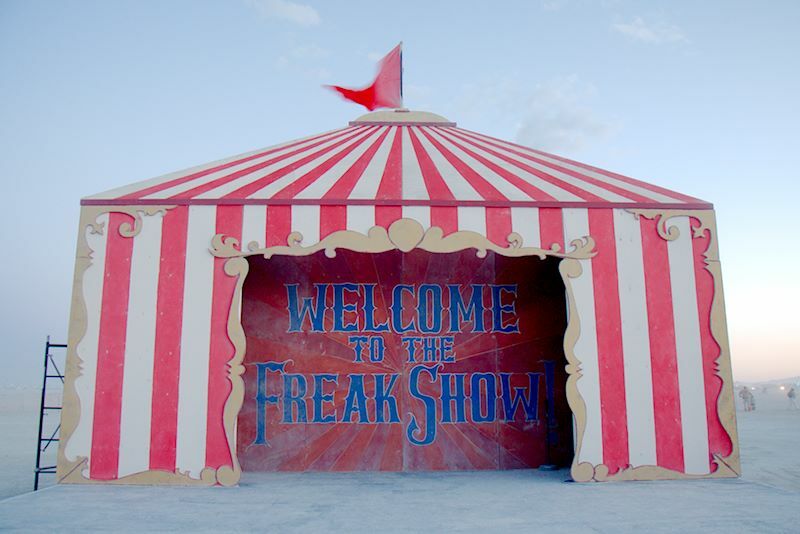 Black Rock City was fashioned into a whimsical carnival midway of sorts. The inhabitants of this BRC came not just as spectators, but as participants, in a mystical carnival in the desert where the people, places, things, ideas, conversations, and experiences that your soul needs, are reflected back to you. Come along as I tell tales of the carnies, gurus, and travellers I met during my week in the desert.